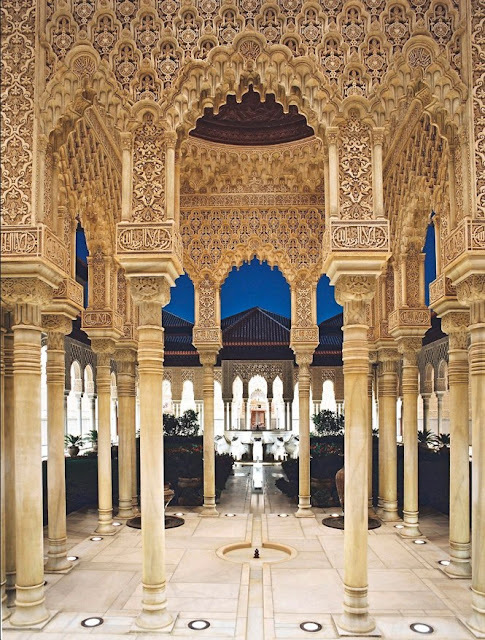 The Alhambra's Islamic palaces were built for the last Muslim Emirs in Spain and its court, of the Nasrid dynasty. After the Reconquista (reconquest) by the Reyes Católicos ("Catholic Monarchs") in 1492, some portions were used by the Christian rulers. The Palace of Charles V, built by Charles V, Holy Roman Emperor in 1527, was inserted in the Alhambra within the Nasrid fortifications. After being allowed to fall into disrepair for centuries, the Alhambra was "discovered" in the 19th century by European scholars and travelers, with restorations commencing. It is now one of Spain's major tourist attractions, exhibiting the country's most significant and well known Berber Islamic architecture, together with 16th-century and later Christian building and garden interventions. The Alhambra is a UNESCO World Heritage Site, and the inspiration for many songs and stories. Moorish poets described it as "a pearl set in emeralds," in allusion to the colour of its buildings and the woods around them. The palace complex was designed with the mountainous site in mind and many forms of technology were considered. The park (Alameda de la Alhambra), which is overgrown with wildflowers and grass in the spring, was planted by the Moors with roses, oranges and myrtles; its most characteristic feature, however, is the dense wood of English elms brought by the Duke of Wellington in 1812. The park has a multitude of nightingales and is usually filled with the sound of running water from several fountains and cascades. These are supplied through a conduit 8 km (5.0 mi) long, which is connected with the Darro at the monastery of Jesus del Valle, above Granada.